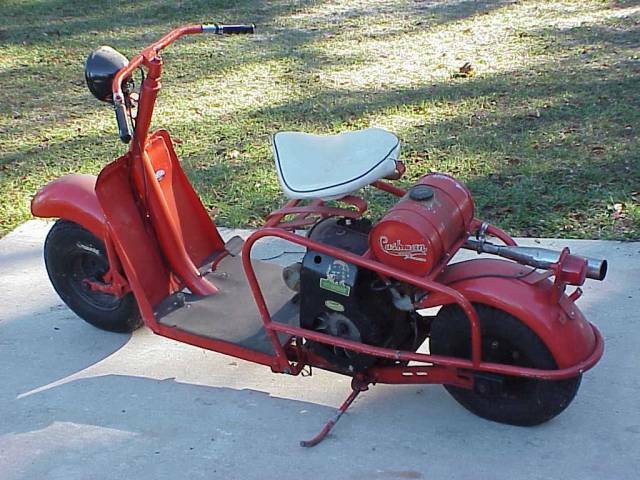 A very early 1937-1938 Cushman Scooter. It is usually referred to as the Milk Stool. This is most likely either a Model 1 or a Model 2. Need Picture 20 Series, made from 1941 through mid-1942. Very similar to the 30 Series below. 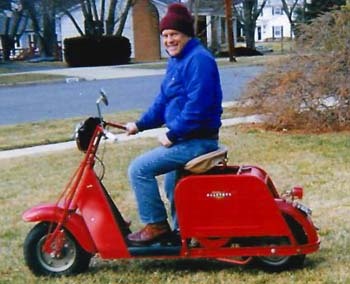 Looking for a picture of this scooter. 30 Series, Model 32 with only a centrifugal clutch or a Model 34 with a two speed transmission and clutch. Many were used at air bases and industrial locations during WW2. Made from late 1943 through 1945. Model 53 Military Airborne. 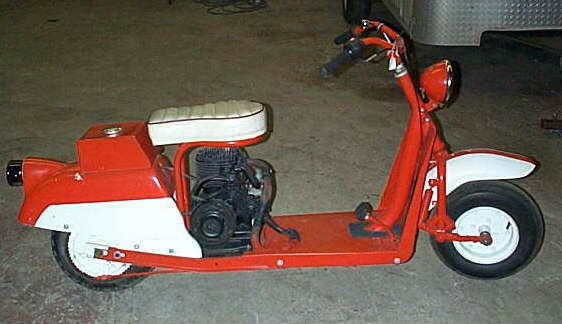 This scooter was manufactured for the US Military during WW2. An authentic Military Airborne is very rare and very collectable. It has no suspension springs front or rear. Introduced in 1944, 4,734 were sold. Model 53A Civilian Airborne. This model was manufactured for civilians after the end of WW2 and is similar to the military model. The civilian model gained a spring suspension system and lights. Sears Allstate model 811.30 introduced in 1948. 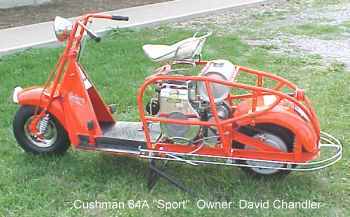 Made by Cushman for Sears. 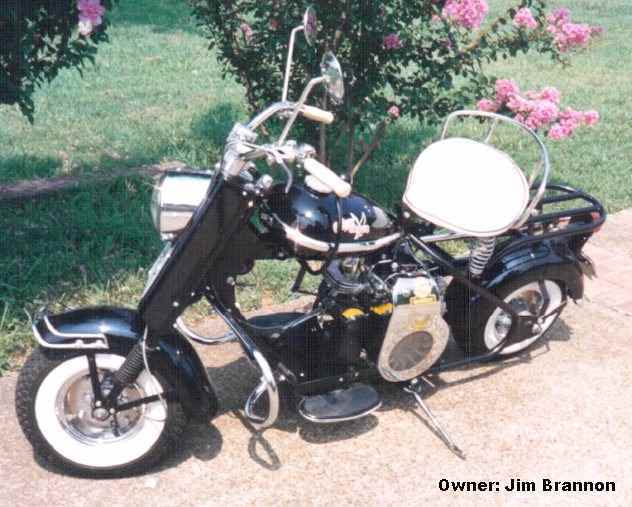 This one is owned by Ron M. Petter Sr.
60 Series. Model 62 with only centrifugal clutch, Model 64 with Varimatic belt drive automatic transmission, and Model 65 with a clutch and two speed transmission. Introduced in 1948 and 1949. There was also a model with a tubular frame. 60 Series model 65A, sometimes known as the "Sport Model". This one was made in 1951. Model 61 Highlander introduced in August, 1949 and discontinued in late 1950 or 1951. Note rear fender fastened directly to the engine. This one may have been a prototype because it has floorboards extending out from the main frame like a model 50 or 60. Model 711 Highlander introduced in December, 1950 as a refined model 61. The engine is on shock mounts and the rear fender fastens to the frame rather than the engine. 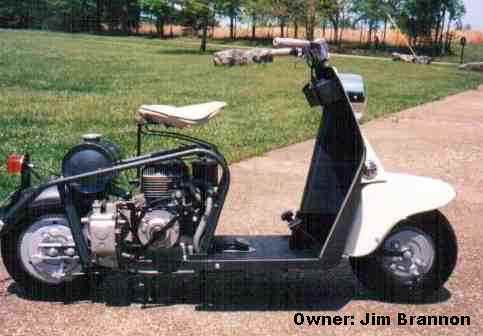 Has a M6 2-3/8 inch engine and a 12 tooth clutch sprocket. Model 714 Highlander introduced in April, 1952 and discontinued in 1953. 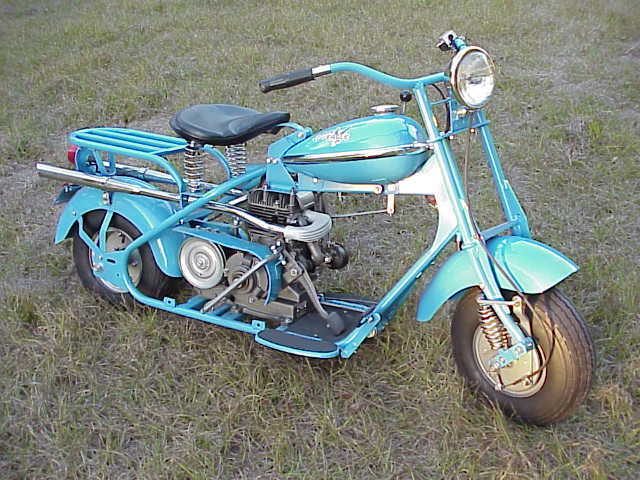 Has a M7 2-5/8 inch engine and a 14 tooth clutch sprocket. Picture identical to the Model 711 above. Replaced by the model 715 in May, 1953. Model 715 Deluxe Highlander introduced in May, 1953 and replaced the model 714. Replaced the Model 714 in May, 1953 and was discontinued in July, 1957. Sears Allstate 811.40 introduced in 1951 and discontinued in1958. Based upon the 711 Highlander. This one is owned by Stan Rocklin, founder of Cushmannet at Yahoo Groups. Sears Allstate Deluxe Model 811.40 introduced in 1951 and discontinued in 1957. This bike is owned by Pat Jones. 1959 Sears Allstate Standard. Note square gas tank atop fiberglass rear fender. This is a rare bike. The Model 765 Barrel Spring Eagle made from 1950 to 1954. It has a centrifugal clutch and a two speed transmission. Early models had welded on floor boards, later models hinge up. The very earliest ones had no reinforcing plates on the front fork and only a small tube extending under the gas tank. This one has a 1955-up exhaust pipe. Model 762 Springer Eagle with centrifugal clutch and no transmission introduced in April, 1952. This was to be an economy model and came less the rack above the rear fender. Production lasted only about one year. Very rare and collectable. 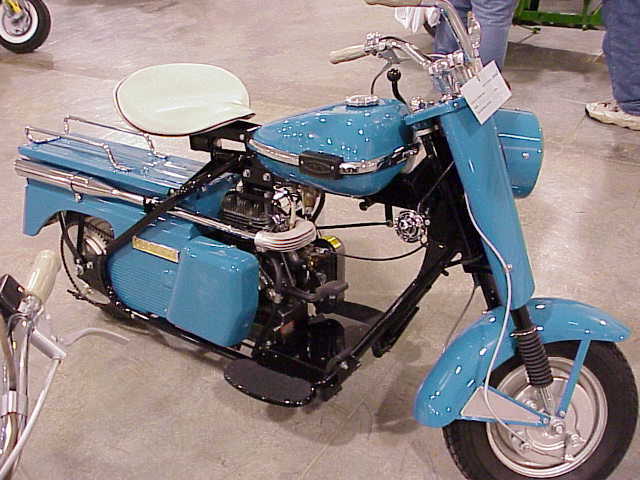 Cushman Trailster introduced in August, 1960. This model has a very high rear end ratio and can climb very steep grades. 1955-1956-1957 Tubular Fork Eagle. There were only minor differences over these years. Some models used an oil bath air cleaner and some models had small hubs with sealed bearings. The 1955 model was introduced mid year. Model 721 1958 Highander with open frame. This model was made for only about 3 months and was replaced with the Model 721 pictured below. Models 722 and 725 Road King. The 722 has a centrifugal clutch, the 725 has a clutch and a two speed transmission. This model is often called the "alligator". There was also an Allstate Jetsweep that is based upon the design of these models. 1958 Eagle First model to use the new smaller transmission with the input and output concentric on the right side. Note that the headlight is still the original stem mounted type. 1959 Eagle. Very similar to the 1958 model except that the headlight mounted directly to the shroud. Cast Iron Super Eagle introduced in November, 1959. This Eagle has a metal enclosure over the rear end. this is most likely a 1960 or early 1961 model. Model 725 Open Frame Road King introduced in October, 1959. Has a centrifugal clutch and a two speed transmission. 1960 & Up Cast Iron Eagle. Note that front shroud is smaller at bottom side than at the top side as shown in this picture. The Cast Iron Eagle was discontinued and then reintroduced in to fill in when the Silver Eagle was removed from the line for modifications. Silver Eagle with OMC aluminum engine introduced in 1961. The early Silver Eagle had a one piece frame. 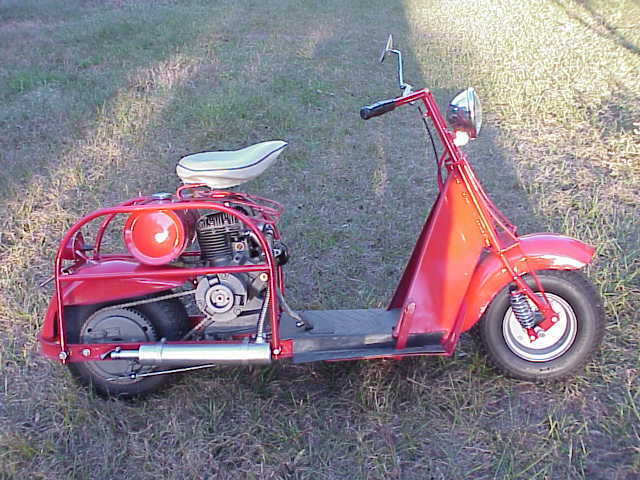 Cushman had serious vibration problems and the scooter was removed from the market for a time and reintroduced with an improved shock mounted sub frame. 1961 Up Super Silver Eagle manual start. 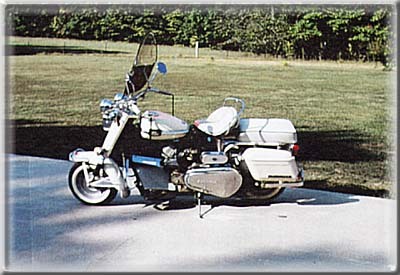 The Super Eagle differs only in that it has a large metal enclosure over the rear end and a different exhaust system. 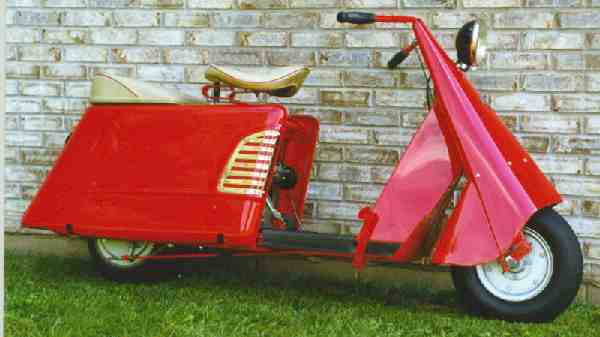 1961 Up Silver Eagle electric start. Notice the battery box on the front floorboard. Same as the manual start except for the addition of the battery and starter. Has a different wiring harness. All Eagles were discontinued in in February, 1966. 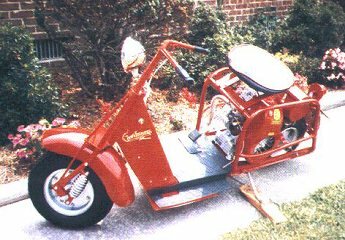 It would not be complete without a picture of the special Silver Eagle that Cushman designed just for the Shriners. This is a very fancy bike!